Before Facebook and Kevin Bacon, "they" said we were all separated by six degrees. No offense to Mr. Bacon, but at that time, I wasn't in the mix. Meaning: we are all six steps away, or less, from knowing each other. There was even a play and movie about it. I read, a few years ago, that with the advent of Facebook, we are now 2.3 degrees of separation. I might tend to believe that. For the most part, I use Facebook for friends that I actually know. I will admit to have accepted invitations from friends of friends. And there are one or two blog followers, whom I have yet to meet, are also FB friends. But those two groups are minimal in numbers. Single digits combined. This blog-thingy factors into that degree reduction too. Take Torn, from Sticky Crows. I started following him due to another (now ex) blogger. Torn and I were possibly the only two regular followers of RJ March, or at least we were the two main commentors on his posts. Years later - in 2010 - I was in Montreal and had the pleasure of meeting him for a few drinks. By this time, Torn and Serge had gotten Georgie, their beagle. While I was an uncle to a beagle, Petey was not yet ours. And then there is Morty. Co-owner of two beagles. A friend for over a quarter of a century. A sometimes reader of my blog. But from my blog, he found Torn's blog, friended him on FB and will "like" any number of Georgie posts that Torn throws up there. And then just this week, Morty met Torn while he was Montreal. 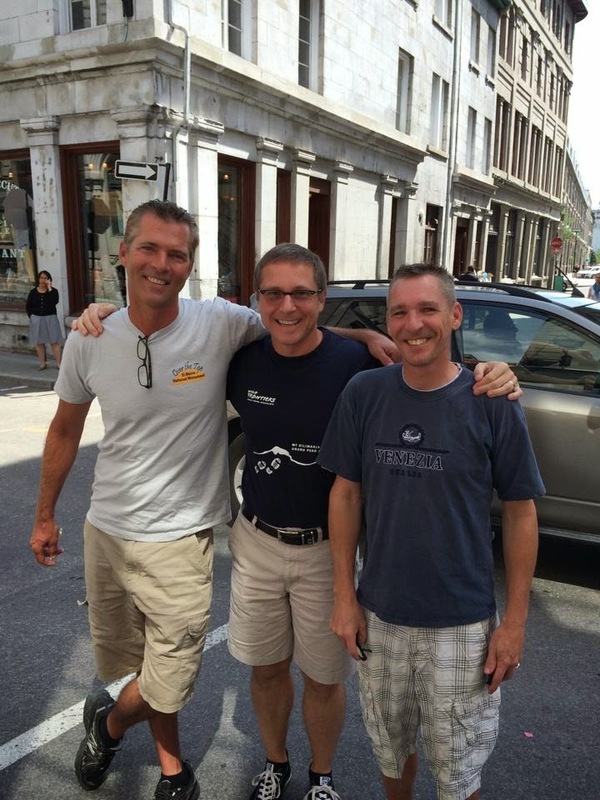 Mort and his "other" crew were in Montreal for an Ironman competition. (I don't think he won, as I'm sure he would have mentioned it at some point.) But Torn, and his husband Serge, played Montreal tour guide to a bunch of guys from 'merica. Judging by the FB pictures and the few international texts I got from Morty, things have seemingly gone swimmingly. I didn't anticipate anything different. So now part of the world is a fraction of a degree closer from separation ....and it's all because of me. BTW Blobby....YOU are a Bacon 3 because you know me. I am a Bacon 2 because my friend Darrie (obviously a Bacon 1) was in a film with him. Torn and Serge were SO wonderful. Thank you, Blobby, for the virtual introduction. This blog thingy will in time bring me closer to others I am sure. Commenting regularly over the years on others has made some great friends for me. It's a good thing! In July of this year 'Torn' & Serge visited us during their week long road trip. I'd been reading and commenting on Torn's blog for years and we have been facebook friends too. I find nearly every blogger I meet to be almost exactly what I anticipate they will be from 'knowing' them through their blogs and/or from facebook.